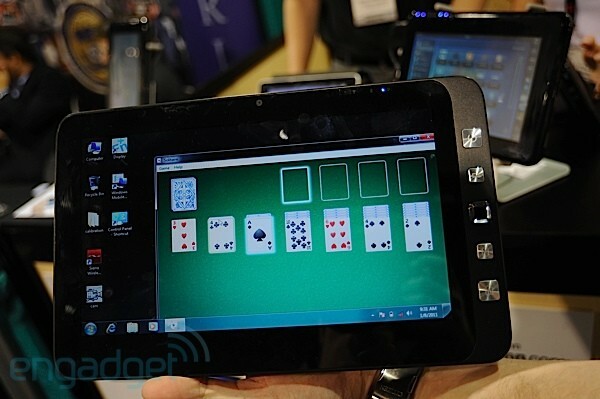 With the announcement of three new Windows 7-based tablets, Netbook Navigator has made a splash in the already flooded world of tablets here at CES 2011. Netbook Navigator showed off the NAV7, NAV9 and the NAV10i for us on the CES show floor, check past the break for all of the details. NAV7 Slate PC: The new tablet is running either Intel's Atom 1.3GHz Z515 or the upgraded 1.6 GHz Z530 processors on a 7-inch multitouch LCD screen. 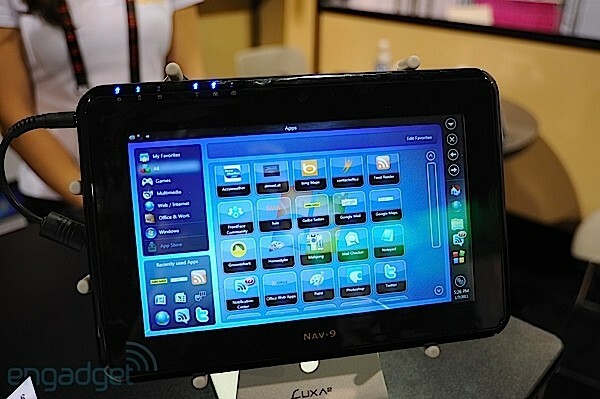 The NAV7 tablet also has a touchpad and pair of mouse buttons on the rear of the device. At just 1.7lbs and 0.7-inches thick, makes it one of the slimmer tablets we've seen this side of CES. Shared throughout the lineup are solid state drives, with your pick of 16GB, 32GB or 64GB capacities, there's up to 2GB of RAM, a 1.3 megapixel front facing webcam, 802.11n WiFi capabilities, Bluetooth 2.1 and optional 3G connectivity through a sim card slot. NAV9 Slate PC: The NAV9 has a new rugged 8.9-inch multitouch low-pressure resistive LCD display. Under the hood you will find a 1.66GHz Intel Atom N450 processor and another USB port bringing the grand total to three. There is also a miniSD card slot for expansion. NAV10i Slate PC: The largest of the three, the NAV10i Slate PC has a 10.1-inch capacitive multitouch LCD display and 1.66GHz Intel Atom N455 processor. Netbook Navigator chose to only include two USB ports and in place of the miniSD card slot is a microSD card slot. At a whopping 0.6-inches thick, the NAV10i is even thinner than its smaller younger brother, the NAV7. While only still in its prototype form the NAV10i seemed pretty fit and finished. The three Netbook Navigator NAV series Windows 7 Slate PCs left a mildly good taste on our tablet tastebuds. The UI was slick and responsive, the hardware had a good solid feel to it; although we weren't a big fan of cheap and tacky hardware buttons on the NAV10i and the gimmicky-small touchpad on the NAV7. With the proper backing from of the big players, Netbook Navigation may have something going for them with these three new tablets.